Even though I said I probably wouldn’t do another half marathon this year, I registered for one yesterday for the end of April. I’m a sucker, but I couldn’t resist when I got a company email looking for employees to join a newly created running team and run this half to raise money for a non-profit. It’s also part of an initiative to get employees in better shape and hopefully reduce health insurance costs, which took another hike this year. Since it’s supporting a good cause, earning brownie points at work, and hopefully shrinking the large chunk taken from my paycheck for insurance, why not? I’ve been doing plenty of running this week already at work and working out and feeling a bit tired actually. Thankfully we’re over the hump for this week and it’s WIAW! 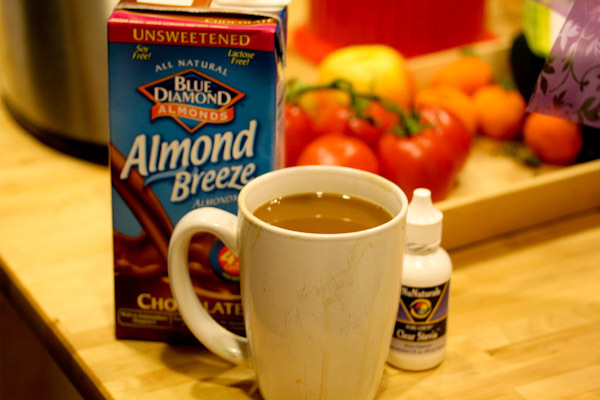 Breakfast: I started the day with two cups of coffee this morning with chocolate almond milk and liquid stevia because I haven’t had time to make fresh hemp milk this week. 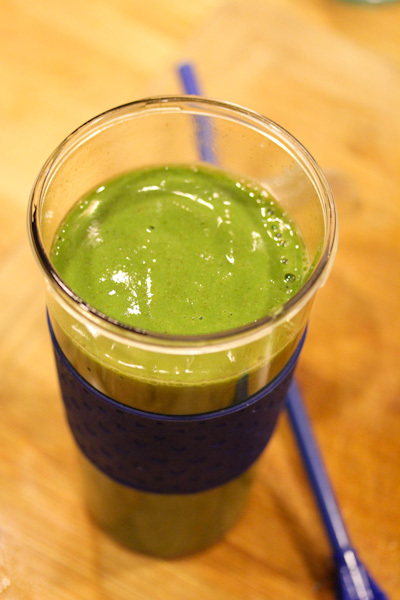 And a smoothie to go packing spirulina, Plant Fusion vanilla protein powder, a banana, spinach, and a chopped carrot. 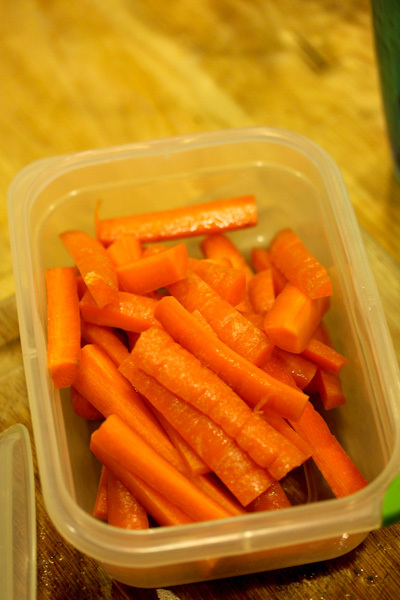 Snack: I packed raw carrots sticks for a mid-morning work snack since I’ve been getting hungry before lunch with all the running around and needed a healthy, filling alternative to hitting the canister of Red Vines some evil person keeps leaving in our department. 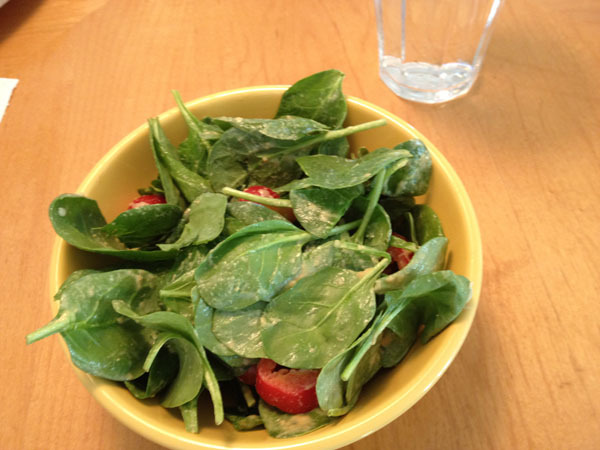 Lunch: A simple salad of spinach, tomatoes, and chopped red peppers. 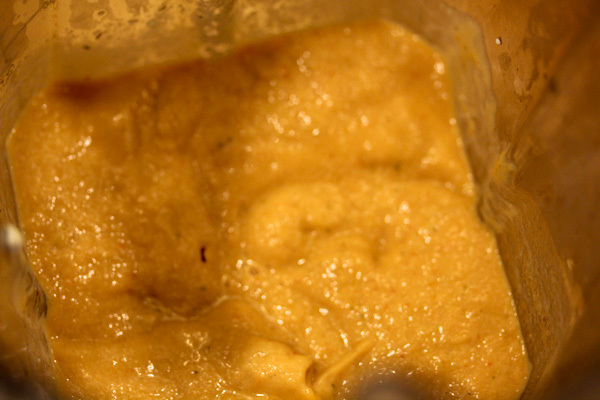 For the dressing, I mixed a glob of hummus, spoonful of nutritional yeast, and a couple of tablespoons of lemon flavored vinegar which was very tasty. Followed by a bowl of fresh popped popcorn with coconut oil and salt. 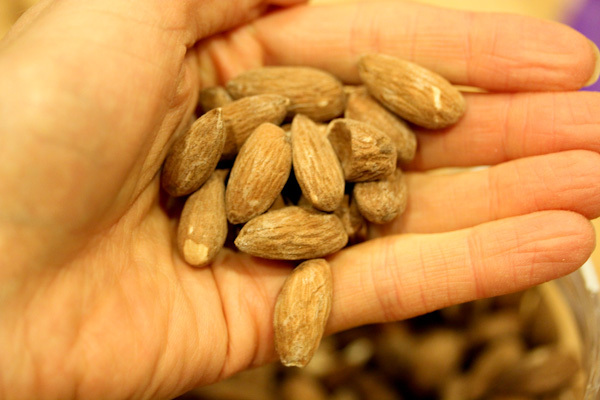 Snack: A handful of roasted and salted almonds. 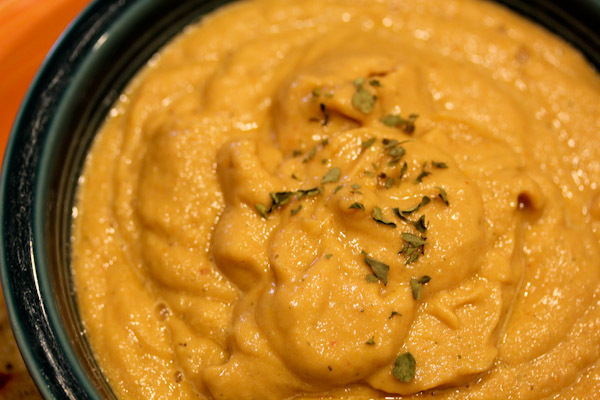 Dinner: Since I’m still working on raw cauliflower recipes I like, I toyed with another soup recipe that was a success with a wonderful texture and savory tomato flavor. Place all ingredients into a high speed blender and blend until smooth and creamy. Makes 2 servings. And I served it with a simple side of chunks of tempeh sauteed with Trader Joe’s 21 spice salute blend and sesame oil. 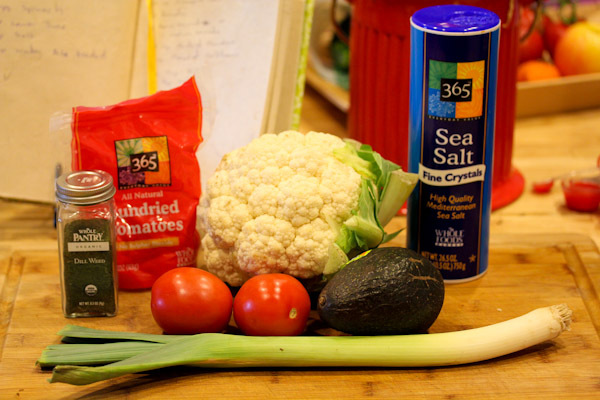 The soup has a wonderfully savory and tomato flavor with a silky texture from the avocado, not at all gritty or bitter as some raw cauliflower recipes can be to me. The leeks added a mild and pleasant onion flavor that was not overkill, it’s a fantastic way to add more raw cauliflower into your diet without the digestive fun that can sometimes come with it. 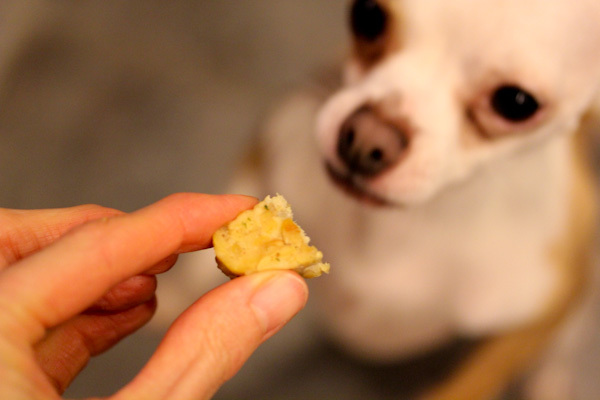 For Miko, the star of the meal was the tempeh, which he begs like crazy for every time I prepare it. 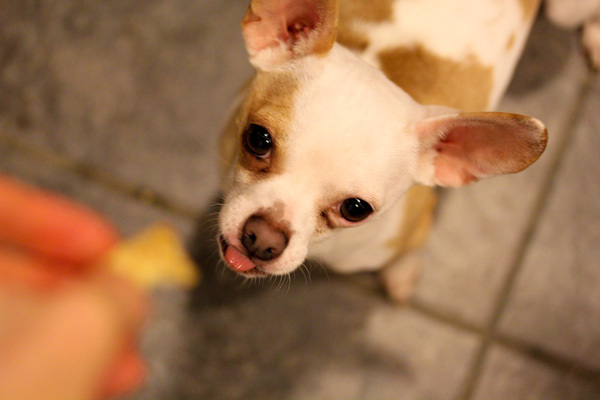 That’s a healthy treat I don’t mind sharing with him. ahhh that face! =) genius call on the sundried tomatoes — i’d looove that!!! and keep vegging it up girl! happy wiaw!!! Aw, thanks. :-) Love WIAW and need more time to participate! 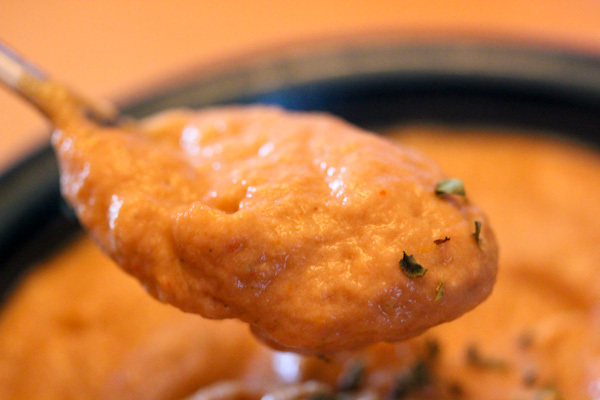 The soup looks delicious and so creamy. Thanks, it has an unexpected creamy texture for a raw cauliflower soup. 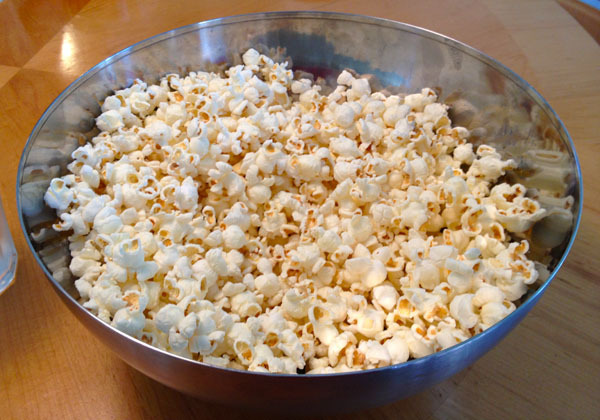 that popcorn…ever since I saw it on instagram earlier today, I’ve had popcorn on the brain! I confess, I’m a popcorn addict and could probably eat it every day if I had the flossing time after! 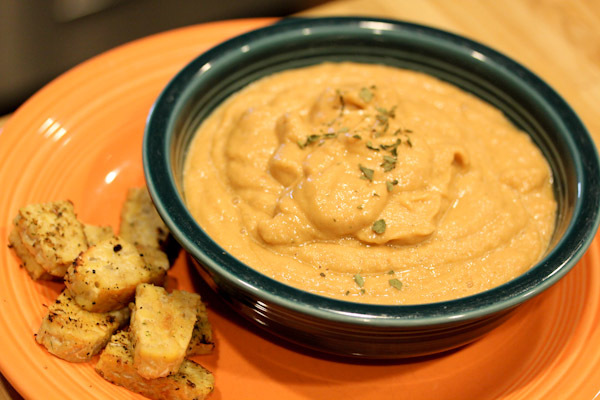 I love that you added avocado to that soup– great idea!! Popcorn is not allowed on this silly slow carb thing I’m doing and I’m so sad.